Scrawled on a chalkboard in the recently opened Prospect Cellars on Plymouth’s Main St., you can see an homage to the families, farmers, vets, county fairs, traditions, sunsets, rain, FFA, 4H pigs, dance partners, dreamers, risk takers, and all the other things that make Amador Amador. And so naturally, in the small-town setting of Amador County, things that happened over 150 years ago are as fresh in people’s minds as last week’s events. Prospect Cellars proprietor Jamie Colburn-Lubenko, the former Executive Director of Amador Vintners Association, calls herself a “Plymouth girl” through and through. Ms. Colburn-Lubenko can talk first-hand about Shenandoah Valley’s 10-acre Zinfandel planting known as the Original Grandpère Vineyard – the oldest and most revered of California’s Old Vine Zinfandels – because, to her, it’s family history. “What everyone knows is that there is a grant deed in Amador County records that shows a vineyard planted there in 1869,” says Colburn-Lubenko, “and that the original vines are still there. This makes it the oldest documented Zinfandel vineyard in the state. “What fewer people know,” she continues, “is that it was a woman named Mahala Teter Upton – my husband Ronn’s great-great-grandmother – who originally took care of that vineyard, with the help of her 8-year old son Rueben. In the aforementioned Original Grandpère Vineyard – that is, what remains of Mahala Teter Upton’s original Zinfandel vines in Amador County’s Shenandoah Valley AVA – you will see curving tracks of a tractor wheels between the rows of spindly, gnarly limbed, head trained, spur pruned old plants; many with trunks split in two, their cores long rotted away, standing 8 by 8-feet across along the site’s sloping, northwards facing hill. For over 70 years Mahala Teter Upton’s original Zinfandel planting continued to serve her family and numerous descendants well. Grapes were sold to locals and, after the start of Prohibition (1920), mostly to home winemakers in the Midwest or on the East Coast. During the 1930s the vineyard was sold to the Steiner family, who held on to it until 1970, when Walt Steiner sold it to its longtime caretaker, John Downing. By then the vineyard had dwindled from 16 to 10 acres. In 1979 a talented Sierra Foothills raised but Germany-trained winemaker named Scott Harvey began to purchase Zinfandel from John and Virginia Downing. At the time, the vineyard’s condition had also hit a low poiint. Ready to retire, the Downings offered to sell to Mr. Harvey – by then married to a local farmer’s daughter, Terri Harvey – in 1982. The Harveys could not afford to buy the vineyard outright. 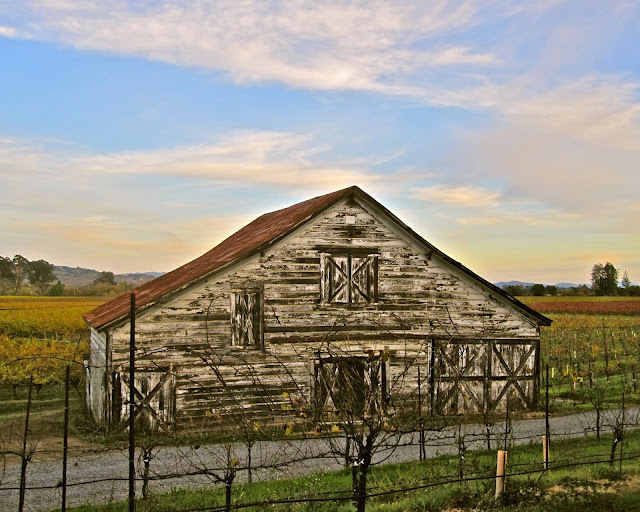 So they signed a 5-year lease to revive the planting – taking a saw to all the dead or gangly wood keeping the vineyard from producing top quality grapes – while fixing up the old, raggedy home on-property (built during the 1880s). They were finally able to take full possession of the property in 1988. Yet all things considered, at 146 years of age Ms. Harvey’s vineyard is in remarkable shape. Just over 80% of the remaining vines are the original ones planted by Mahala Teter Upton and her son Rueben. In most California vineyards over 100 years old, retention of 50% to 70% of the original vines is considered a good percentage. Over the years Ms. Harvey has been replanting “dead” spots with new vines, utilizing cuttings from the original vines to maintain a clonal purity. The new plantings are grafted onto phylloxera-resistant rootstock, since the infamous root louse that devastated well over 99% of the vineyards in California and around the world during the late nineteenth century still remains a threat to natural (i.e. “own-rooted”) vines. All of the 1869 vines in the Original Grandpère Vineyard still grow on their own roots. “We have phylloxera here, but it doesn’t get carried away because this vineyard happens to sit on the sandiest soil in Amador County,” says Ms. Harvey, in reference to the mixture of finely decomposed granite (i.e. sand) and loose clay loam on her slopes. To hedge her bets, Harvey uses equipment exclusive to the vineyard, and rarely allows outsiders to tromp through, to minimize the possibility of pests, microscopic or otherwise, carried in from other vineyards. “But it’s mostly because we are in a sandier spot of the Foothills that these old vines have been able to survive,” she tells us, “whereas plants in surrounding vineyards have not.” There are, incidentally, a few old stands of own-rooted Mission – an even sturdier type of Vitis vinifera – dating back from the 1850s and 1860s in Shenandoah Valley, although it was Zinfandel that the early miners-turned-farmers preferred. Despite the other ever-present danger of “tractor blight,” the natural wild grasses that grow around Grandpère’s vines need constant mowing and discing because the ancient plants are low-yielding enough – in an average year, producing tiny, fist-sized clusters (clusters on young Zinfandel vines are easily three times that), barely adding up to 1 to 1.5-tons per acre – without having to compete with grasses for water and nutrients on this 1,300-ft. elevation hillside. Yet it is also because these ancient vines have been dry land farmed all their lives (it is only the young, new plantings that ever see irrigation) that they have been able to survive nearly 150 years of cycles – periods of drought, excess rain, cold vintages, hot vintages. Sandy soil forces deep rooting, and deep roots contribute to healthy, productive plants – a symbiosis you see in other regions (such as Lodi and Contra Costa) replete with sandy soils and ancient vines. In the late 1960s and 1970s, some of Amador County’s old vine Zinfandel growths began to attract a lot of attention when wineries like Sutter Home, Montevina and Carneros Creek began to wow California wine lovers with the typically perfumed, finely etched and spicy qualities of the fruit. Despite the ancient eminence of Mahala Teter Upton’s planting, the vineyard had absolutely no identity until the 1980s. This would not happen until Scott Harvey began to fashion wines from it under his Santino Winery label; and then a little later, for a short time (1993-1995) with a partner (Robert Smerling) at Renwood Winery. The latter relationship would end in a litigious fashion, almost as bitterly as the divorce between the two Harveys around the same time. It is Mr. Harvey, however, who gets credit for naming the vineyard “Grandpère” (there were also “Grandmère” Zinfandels, produced from younger neighboring vineyards). Today, the confusing thing for both consumers and the wine trade is that there is also a Renwood Grandpère Vineyard Zinfandel, made from a vineyard planted by Mr. Harvey for Renwood during the early 1990s from cuttings taken from the original 1869 planting, grafted onto phylloxera-resistant rootstocks. Although Mr. Harvey was the one who put Grandpère on the map, his former partner at Renwood was the one with the foresight – some say duplicitous, others say smart – to trademark the name, and be able to exert said rights following Mr. Harvey’s split with Renwood Winery. “We were stupid,” says Terri Harvey. “We should have trademarked the name years before, and then Scott and I were going through our own problems. I wanted to buy Scott out and keep the vineyard – at the very least, to keep the girls (the Harveys have three daughters, now grown and happily successful) in their own home. “Eventually everyone came to a compromise,” she tells us. “I kept the property. Smerling kept the rights to the Grandpère name, but allowed us to sell our grapes as Original Grandpère. And Scott – he was fed up with everything; the suits, counter-suits, some pretty wild accusations.” Mr. Harvey would move to Napa Valley, where he would help to launch Folie à Deux Winery into national prominence. Just to get it all straight: Zinfandels from Mahala Teter Upton’s own-rooted 1869 planting are currently bottled as Original Grandpère Vineyard. Today, these wines are produced by just four wineries – Andis Wines (located nearby on Shenandoah Rd. ), MacchiaWines (based in Lodi), Vino Noceto (as OGV Zinfandel), and Scott Harvey Wines (who calls it Vineyard 1869). Since Terri Harvey refuses to sell grapes to Renwood Winery, the Renwood Grandpère Vineyard Zinfandel is made from those younger grafted vines that went into the ground in the 1990s with the use of cuttings from the original vineyard. Because, as she puts it, “You cannot make a living from an old 1-ton-an-acre vineyard,” Terri Harvey and her business partner, grape grower Pat Rohan, now manage some 29 other vineyards (totaling about 550 acres) in Amador County. Most recently, Scott Harvey has successfully developed two other brands, Scott Harvey Wines and Jana Wines, in partnership with his second spouse Jana Littman, working out of Napa Valley. But after a 20-year absence from the Foothills, Mr. Harvey has recently christened new tasting rooms in both Sutter Creek and Plymouth (with signs on Shenandoah Rd. saying, “Scott Harvey is back!”). That’s the history – what about the wine? From the beginning, Zinfandels from the Original Grandpère Vineyard have never been known for sheer size, power or strength; but rather, for a lanky, sometimes even lean, sinewy length of flavors, mixing bright, floral fruit with mildly earthy, loamy, occasionally crushed or green leafy notes. You don’t buy an Original Grandpère to be bowled over – you buy it to be buoyed or enlightened. The 2011 Vino Noceto OGP (The Original Grandpère Vineyard) Zinfandel shows exactly that, but with a beautifully fresh intensity of flowery perfume – wrapped around a bright core of raspberry/blackberry fruit – and long silky, balanced, zesty qualities shoring up its modestly weighted (14.1% alcohol), medium-full body. This wine is a limber lover, not a lumbering fighter. Folena adds, “We pick for ripe flavor, and so sugars can vary year to year, from 24° to 27° Brix. Complexity can come in different ways. We destem and break berries without mashing them, and we do a submerged cap fermentation to get a slow, low, gentle extraction, no punch-downs or pump-overs” – a gentle approach that further enhances the Original Grandpère’s characteristic delicacy. “The fact that the vineyard faces mostly north has probably always contributed to its subtle character, different than anything else in Shenandoah Valley,” says Folena. “Sometimes we’ll get a good second crop (less ripe fruit from late flowering clusters), which we’ll pick for more acidity. “And like other vineyards in the area, Grandpère does get a little bit of red leaf (leafroll virus is typical of Zinfandel clonal material planted in Amador County), which can give different degrees of ripeness in a single vine” – the latter issue, something Ms. Harvey has been able to offset somewhat with usage of KDL® (a foliar macronutrient) and other measures to extend photosynthesis and more efficient fruit maturation longer into the season. Nice Article.....We are the best Body massage centre in chennai. I wish you can update articles often. I hope I could read them everyday. Your posts offer advice to me.